Title trilogy! 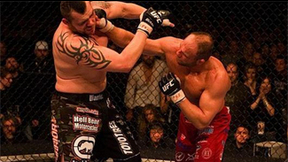 At UFC 57, with the series tied 1-1, the former champ tangled with the current UFC light heavyweight champ for the third time inside the Octagon as Randy “The Natural” Couture took on Chuck “The Iceman” Liddell. 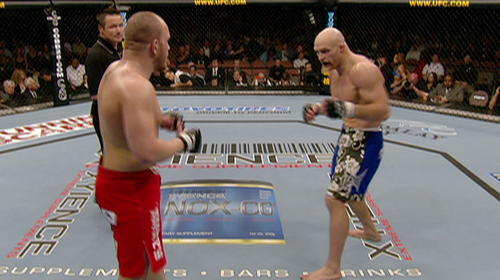 Chuck Liddell vs Randy Couture UFC 57 Tue, Apr 4, 2006 (2:43) Chuck Liddell and Randy Couture battled it out for the third and final time with the UFC® Light Heavyweight Title on the line. Brandon Vera vs Justin Eilers UFC 57 Sat, Feb 4, 2006 (9:36) The undefeated Brandon Vera made an impressive Octagon entrance with his TKO win at Ultimate Fight Night 2. 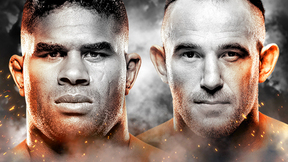 In his second UFC bout, “The Truth” would be tested by another stand-up fighter with knockout power in Miletich Fighting Systems’ Justin Eilers. Marcio Cruz vs Frank Mir UFC 57 Sat, Feb 4, 2006 (16:13) Frank Mir's long awaited comeback was over quickly as he fell to another Jiu-Jitsu master Marcio Cruz in the 1st round at UFC® 57. Renato Sobral vs Mike Van Arsdale UFC 57 Sat, Feb 4, 2006 (8:35) Appearing almost unstoppable in his second UFC stint, BJJ blackbelt Renato “Babalu” Sobral netted back-to-back submission wins en route to a big bout with the 8-2, former NCAA Division I National Champion wrestler Mike van Arsdale. 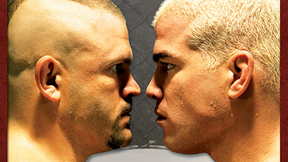 Joe Riggs vs Nick Diaz UFC 57 Sat, Feb 4, 2006 (28:37) Both welterweights were angling to rebound from recent losses, as the 23–6, 1 NC Joe “Diesel” Riggs stepped into the Octagon to test his boxing & BJJ skills with the 11-4 Cesar Gracie Jiu-Jitsu product Nick Diaz. Alessio Sakara vs Elvis Sinosic UFC 57 Sat, Feb 4, 2006 (29:03) Looking to make a solid second impression following his bizarre no contest debut, Italian pro boxer & pro MMA fighter Alessio “Legionarius” Sakara entered the Octagon against the Australian Octagon veteran & ground specialist Elvis Sinosic. 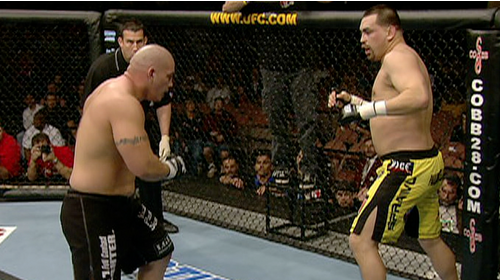 Paul Buentello vs Gilbert Aldana UFC 57 Sat, Feb 4, 2006 (19:18) After a disappointing loss vying for the UFC heavyweight title, Paul “The Headhunter” Buentello got back on the horse or, better yet, back in the Octagon to trade knockout blows with a debuting, undefeated power-puncher Gilbert “El Peligro” Aldana. Jeff Monson vs Branden Hinkle UFC 57 Sat, Feb 4, 2006 (13:54) The 2x ADCC Submission Wrestling World Championship gold medalist Jeff “The Snowman” Monson returned to the Octagon after a 4 absence putting together a 13 fight win streak against “The Iron Lion” Branden Lee Hinkle from Team Hammer House. Keith Jardine vs Mike Whitehead UFC 57 Sat, Feb 4, 2006 (27:13) In a light heavyweight tilt between The Ultimate Fighter 2 alumni, Keith “The Dean of Mean” Jardine put his 9 fight unbeaten streak on the line against the 9-4 former college wrestler Mike Whitehead.